Having decided to proceed with a planned trip to Fukuoka, Japan despite recent earthquakes in nearby Kumamoto, I did what any self-respecting student of Asian art history would do and dutifully made my way to the Fukuoka Asian Art Museum. Home of the Fukuoka Asian Art Triennale and claiming to be “the only museum in the world that systematically collects and exhibits Asian modern and contemporary art”, the Museum’s permanent collection consists of Asian artworks from the 19th century to the present day. Aside from selected works from the Museum’s permanent collection, three temporary exhibitions were running at the Museum during my visit in late April 2016, two of which focused on Realism. The first of these, with the somewhat florid English title Amazing! So Real! 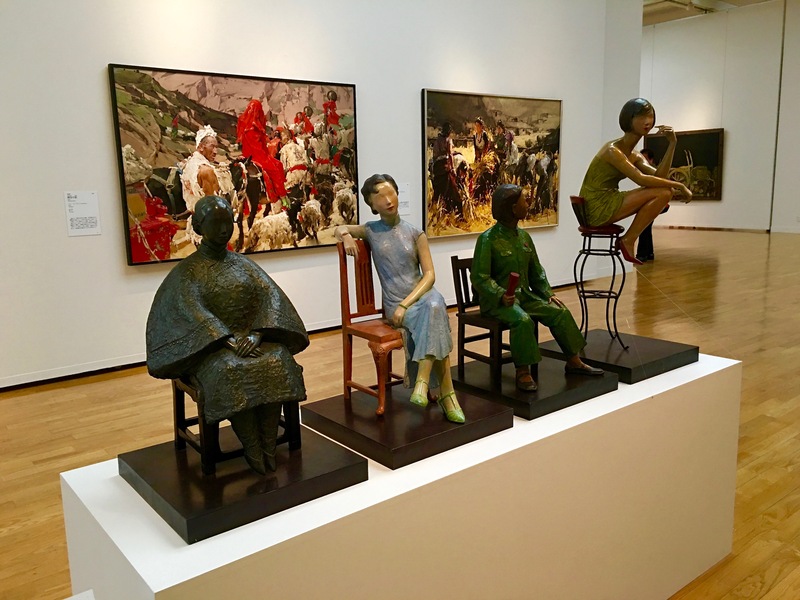 Art of Likeness features realist paintings and sculptures from a number of Asian artists, and appears to have been intended as a companion exhibition to the show in the adjacent gallery with an equally flowery English title, All Sorts of Flowers: The Sparkling Garden of Chinese Realism. In an interesting contrast, the third temporary exhibition at the Museum, Forests of Meditation, features more conceptual works focusing on the spiritual and the inner world, like Singapore artist Baet Yoke Kuan’s 1992 work, Fire. Baet Yoke Kuan, Fire, 1992, copper, etc. A tiny, inconspicuous, yet exquisite work by Japanese sculptor Yoshihiro Suda was one of the first pieces that I encountered upon entering Asia Gallery A. Set in a glass case, this life-size hyper-realistic replica of a common weed that he found on the banks of the Hakata River was carved by the artist during his residency at the Fukuoka Asian Art Museum in 2002. In the adjacent wall-text, we are told that there is another iteration of this work, Weed, that is exhibited elsewhere in the Museum, with a hint that it may be found somewhere “near the connecting corridor on the 8th floor”. Unfortunately, as I progressed through this exhibition and the rest of the collection, I foolishly forgot to look for the work along the way. It would have been interesting to see the work displayed in the manner that the artist intended, as a site-specific installation rather than in a glass case. A video of the artist installing his work at the Victoria & Albert Museum, London, for the 2008 exhibition, Out of the Ordinary – Spectacular Craft at the V&A (video from the Victoria & Albert Museum, London). In contrast to Suda’s tiny sculpture of the humble weed, Filipino artist Julie Lluch’s life-sized terracotta sculpture of a woman in her traditional milieu, the kitchen, is difficult to miss. In her work, Cutting Onions Always Makes Me Cry, 1988, Lluch depicts a woman, surrounded by various ingredients such as a bloodied chicken, a dead fish, fruits and vegetables, weeping as she slices onions while preparing the family meal. Lluch’s sculptures in terracotta often highlight issues that ordinary women face in their everyday lives. Other works in a similar vein include Philippine Gothic, 1984, depicting the artist and her husband (with the family dog between them), her husband looking very much the traditional dominant male head of the household, while she herself is portrayed as a bored, tired and passive housewife, and Picasso Y Yo (Picasso and Me), 1985 where Lluch stares in horror at a fish burning in a fry pan as her disdainful child gazes away from her and the ruined meal. While Lluch often uses her art to “overcome her rage” about the day-to-day struggles she faces as housewife, mother and working artist, she does so with wit and a satirical tongue-in-cheek humour that make her work accessible and engaging to the viewer. Indonesian social realist painter, Dede Eri Supria, on the other hand, is concerned with drawing attention to the negative impact of urbanisation on the poor and the marginalised in Indonesian society. His oil painting , Lack of Space I, depicts an elderly village woman, dressed in traditional clothes, her face lined, weathered and sorrowful, a litter of piglets behind her. She sits, however, not in a rural landscape but surrounded by modern buildings and the detritus of the city, including a mysterious maze-like structure in the background. Dede Eri Supria was one of the founder-members of Gerakan Seni Rupa Baru, the New Art Movement, an important group of Indonesian artists who, in the mid-1970s, made a significant contribution to the ongoing narrative on Indonesian art history. Experimenting with Western avant-garde art and ideas and applying them to real-life issues within Indonesia, the group was preoccupied with contextualising art and bridging the gap between fine art and popular, commercial, mass-produced images. Supria takes photographs of the bustling Southeast Asian metropolis that is modern-day Jakarta and stitches fragments together to form disconcerting, yet strangely familiar, cityscapes, peopling them with uprooted rural folk or the urban poor such as becak (Indonesian pedicab) drivers and labourers. He then sketches and paints these stitched-together photographic images on large canvases, creating brooding and often harsh depictions of the rural and the poor in a city that is brutally indifferent to their plight. His artistic skill lends the works a photo-realistic authenticity that effectively conveys the plight of his marginalised subjects to the viewer. Supria’s work is exhibited next to a large-scale photo-realistic work by another Indonesian painter, Chusin Setiadikara, entitled Kintamani Market II. This work depicts what appears to be a typical scene in a Balinese marketplace, with market vendors and their customers busily bending over baskets of fruits and vegetables. It takes the viewer a moment to notice something strangely out-of-place, hovering over the people – a spaceship-like craft which is apparently the Starship Enterprise from the popular American sci-fi television series, Star Trek. Chusin Setiadikara, Kintamani Market II, 1996 – 99, oil on canvas. Born in Bandung, Indonesia, the artist moved to Bali in 1987 and, since then, has often painted scenes of Balinese life. Like Supria, he paints from photographs that he then re-arranges, composes and stitches together. The insertion of the futuristic image of a spaceship into this rural market scene can be read as his comment on, or critique of, the modernisation of Bali, particularly when we read, in the accompanying wall text, that the old Kintamani market that is the subject of this painting will soon be demolished to make way for a modern supermarket. Wall text, Kintamani Market II, Fukuoka Asian Art Museum, April 2016. A common theme that ran through many of the works in this exhibition was the sober reality of life for the ordinary man. Most of the subjects depicted were rural folk, the elderly and the working class. These subjects, brought vividly to life on the canvas, certainly served as an effective showcase of the artists’ ability to approximate visual reality with consummate skill.